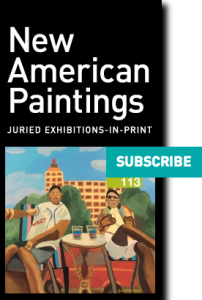 New American Paintings sponsors six juried competitions per year. The forty winners of each competition receive a four-page, full-color spread in New American Paintings. Five of the annual competitions focus on geographic regions (Northeast, South, Midwest, West and Pacific Coast), and the sixth is only open to current Masters of Fine Arts candidates who are attending schools based in the United States, and current year graduates.